Hi, I’m Sarah, and Halloween is my favourite. I love scary things. I mean, as I write this, I’ve also just paused a terribly awesome ghost audiobook about a haunted inn, I’m burning a fall-scented candle, I’m rolling around in a room full of seasonal sweaters, I’m brewing a pumpkin spice latte in my cozy kitchen: I’VE GONE FULL FALL, and I’m so ready for the 31st. I kept thinking about the photos I have from when I was a kid, the ones of me in costume, with my friends, dressed in costumes that took my mom forever to get me into. I was a black cat, a news reporter (I dressed almost normal, except I walked around with a microphone and recording case and gave obnoxious interviews), a pink dog, and Little Red Riding Hood. What I love the most about so many Halloween costumes is the time and effort put into every beautiful piece - the excitement, and the love, and the memory-making - and this year, I want to photograph that. To book, shoot me an email through the contact form, and let me know what your day preference is. 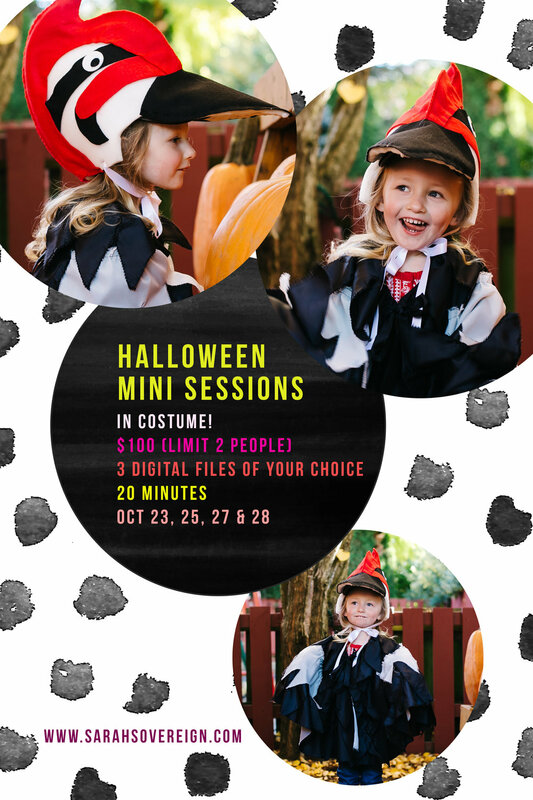 Spots are limited, so book soon!